Wow, so that was Caraval. This book has been so hyped for so long, that it almost feels as if I had been waiting for it for half my life. And though I must admit that I let the hype get to me and ended up just a bit disappointed with some things, I can’t deny that it is one of the most unique reading experiences I’ve ever had. And that’s why I definitely recommend everyone to read it, because this is one of those books that you just can’t NOT read. It’s a story you simply must experience for yourself. What makes it so unique? Well, definitely the clever and magical combination of the plot and the setting. I mean, the blurb already promises something that’s more than just a game or competition, but something closer to magic. And it is. The minute the characters set foot on Caraval, they are lost in this magical, haunting, wonderful world. And so is the reader. Prepare to get completely absorbed in the game. I’ve seen a lot of people compare this to The Night Circus by Erin Morgenstern, but I must admit I haven’t read that yet (I know, I know, shame on me!) so I can’t give you my opinion on that comparison. What Caraval did remind me of was a weird little mix of the unexpected magic of Alice in Wonderland, with the atmosphere of Pirates of the Caribbean. Everything is painted to clearly, it’s like a gorgeous movie playing in your head. This setting is so completely unique and vivid and whimsical and it is definitely the star of the book. But while the setting may steal the show, I also have to give major compliments to the plot, which is fast-paced and unpredictable as can be! Which of course only adds to the Caraval experience. 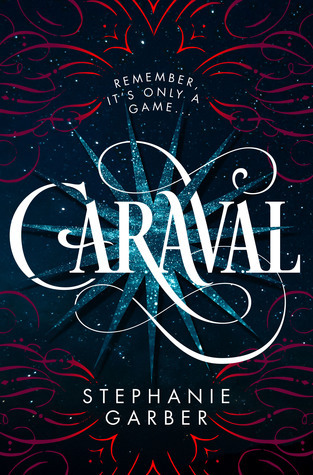 The mystery of Caraval is complex and magical, and while you may think you have it all figured out, trust me when I say that you probably don’t. At least, I didn’t. Twists and turns and revelations follow eachother so rapidly, it’s hard to keep track of what’s real and what’s not. Concerning the pacing, I must say that while the book is incredibly fast-paced and enticing and will likely make you want to rush through it to get answers, I think it’s better to take your time and read relatively slowly. I rushed through in my mad frenzy to figure it all out, but in doing so I fear I may have missed a lot. I’d suggest going slow and letting the magic really soak in for the optimal reading experience. Another thing I really liked about this story was that the driving force behind it all was sisterly love. The story is really all about the love between Scarlett an her sister Tella, and everything they would do for eachother. And I personally loved how Scarlett never lost track of her one goal to find and save her sister. Amidst the craziness of Caraval, and her growing romantic feelings for Julian, she may get a little distracted sometimes, but still never loses sight of what matters most to her, which is getting her sister back. So if it was that great, why was I disappointed? Well, maybe it was because, as I said, I rushed through the book too quickly and missed a lot. But I had a lot of problems really connecting to any of the characters. Other than her desire to save her sister, I didn’t find a lot interesting about our main character Scarlett. She felt quite flat and one-dimensional to me. Tella also never really became much more to me than the damsel in distress. And Julian definitely had his swoony moments, but I also never really connected to him, or the romance, which really bummed me out. The amount of feels I got were minimal and for me that was mainly because I was lost in the game and didn’t know what was real and what wasn’t. Hence, I didn’t trust Julian at all and I didn’t feel a lot of chemistry between Scarlett and him. But, this was a personal experience for me, so it may be completely different to you! Also, at the end I felt so completely whiplashed from all the sudden twists and turns that I… I felt completely disoriented. I’m counting this as both a good and a bad thing. Good because I love when books keep you guessing all the time and even keep you thinking long after you turned the final page. And bad, because I didn’t get it and I just want a little more clarity! I also wanted more from Legend, the mastermind behind Caraval. At the end of the book, I feel like I still didn’t understand him or his motives. But like I said, maybe I should have just read the book at a much slower pace and that might have solved a lot of my little issues. Overall, though I had a few reservations and was a bit disappointed, I still couldn’t bring myself to rate Caraval any lower than 4 stars. Because it really is such a unique must-read. It’s fun and fast, magical and mysterious, vivid and whimsical and just absolutely gorgeous. I’ll definitely be waiting for the sequel, which I’ll dive into after a (slower) re-read of this book. Have you read Caraval? What did you think about it? Good review! One of my worst fears as a book lover is to not have the book be as good as it’s expectations. Later today I plan to go to the library and check this one out, in the mean time I’m trying to lower my expectations so that when I get it I won’t be sad. I love how in depth you went in when you reviewed this, it was VERY helpful! Ah Lindsey – I’m so sorry that this one was disappointing in some ways! I really enjoyed it but I can totally agree that it’s easily rushed and you lose some things that way. It is so fast and frenzied though, and as you say, twists and turns and totally unpredictable. I think a reread before the next book will be a good thing and honestly, after this one I can’t wait to see where Garber is headed next! Sorry you were disappointed by this! But what a great, thoughtful review 🙂 You’ve given me a lot to consider, which I’ll keep in mind when I finally get round to reading this book! Thanks Amy! Hope you’ll enjoy Caraval a lot more than I did! Lovely review Lindsey! And I can totally get the part where you said that you were speeding through due to which you missed some stuff. That happened to me when I read Lady Midnight, but when I reread it, I figured out so much more things which I hadn’t the first time through. This was I think the most hyped book of this year so far, and I don’t know what my opinions will be on this since the hype usually gets to me and I start hating the book. I am excited though to see what this book holds! Thanks Prabhleen! And yes, I definitely think that if I take the time to re-read this one, I’ll end up enjoying it more. Hype is definitely not always a good thing. Hope you’ll enjoy it a lot more though! I’m glad you enjoyed it. You’re not the first person I’ve heard say it didn’t live up to all of it’s hype. Most people are raving about it. But I’ve seen a few that just were let down by this book. I’m not really into circuses so I don’t know if I’ll be reading it. Maybe. Great review! I can understand, I felt that way about Red Queen, the hype killed that book for me. It was way too hyped. Hype can hurt a book as much as help it.